One of the key factors in Differential Interference Contrast (DIC) microscopy is "shear amount", which helps determine resolution and contrast. Shear amount refers to the minute difference in the distance within the specimen that two paths of light are made to travel by interference. The light paths are divided by Wollaston or Nomarski prisms to provide the interference patterns. Increasing the shear amount provides greater contrast, but at the cost of resolution. When using a normal ocular lens to observe, it is common practice that the shear amount should be approximately one half that of the resolution of the objective. Nikon uses a short-shear prism to enable imaging of extremely fine structures. Two short-shear prisms are offered, the CFI Plan Apo 60X oil prism and the CFI Plan Apo 100X oil prism. The Plan Apo 60X oil has a shear amount of 0.04 mm and a 1.40 N.A., which is approximately 1/5 of its resolution. Normally this would render insufficient contrast to make details visible to the naked eye, but the VEC (Video Enhanced Contrast) method of electrical signal processing transforms the signal into a high contrast image. With a DIC microscope, its maximum obtainable contrast (R) is calculated by R = 2 x S. (S is shear amount). Decreasing shear amount provides greater resolution, but contrast suffers. This problem can be solved using bright optics with a high EF and VEC. This system allows visualization of extremely fine structures of living cells, which heretofore had been virtually impossible to observe. D denotes the phase contrast arising from the differing refraction indexes between the specimen and its surroundings as the plane wave passes through it. In order to verify the 0.2 micron resolution, electron beam lithography was used to create an assay specimen from the cross section of 1-2 (approximating a living specimen), the image of which is shown in 1-3. Since the phase contrast for specimens with a thick end section is large, ordinary DIC techniques lead to a prominent halo effect, which inhibits visualization of fine structures (Sample image 2-1). 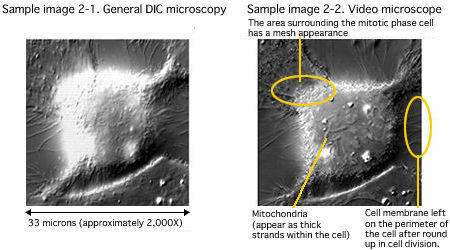 This halo effect is reduced with high resolution DIC using short shear amount, allowing fine structures to be easily visualized, even thick specimens such as mitotic phase cells (Sample image 2-2). High aperture objectives give an extremely shallow depth of field, allowing thin optical sections to be imaged and minute processes (especially in thick specimens) to be observed effectively.